The first rocky planet confirmed to be orbiting another staris truly one strange world, with rock rains, potentially raging volcanoes, and hugetemperature differences between its night and day sides. This hellish rockmight also be the remnant core of a former gas giant whose atmosphere long agoevaporated away. CoRoT-7b (named after the French telescope that discoveredit) is a so-called "Super-Earth" orbiting a star about 480light-years from Earth. Weighing in at just five times the mass of Earth and notquite two times the Earth's radius, this extrasolarplanet was the first of the more than 400 that have beenfound to date that was confirmed to be a rockyworld, instead of a gas giant. But this exoplanet is anything but Earth-like. CoRoT-7b orbits just 1.6 million miles (2.5 million km) outfrom its parent star, or 23 times closer than Mercury is to the sun in oursolar system. This close proximity sends temperatures on the star-facing sideof the planet up to a hellish 4,000 degrees Fahrenheit (2,200 degrees Celsius). The planet is tidally-locked, so the same side is alwaysfacing its star (just as the moon only presents one face to the Earth). The farside of the planet is therefore always in shadow, and temperatures there dipdown as low as minus 350 F (minus 210 C). The possibility that CoRoT-7b?s current appearance may justbe the shriveled remains of a former gas giant glory also casts another oddityatop the pile. "CoRoT-7b may be the first in a new class of planet -evaporated remnant cores," said Brian Jackson of NASA's Goddard SpaceFlight Center in Greenbelt, Md. The temperatures on the star-facing side of the planet areso hot that they can vaporize rock. Scientists who modeled the atmosphere ofCoRoT-7b determined that the planet likely has no volatile gases (carbondioxide, water vapor, nitrogen), and is instead likely made up of what could becalled vaporized rock. The atmosphere of CoRoT-7b could have weather systems thatunlike the watery weather on Earth cause pebbles to condense out of the air andrainrocks onto the molten surface of the planet. And if the planet doesn't already sound inhospitable topotential alien life, it also could be a volcanic nightmare. New evidence presented last week at the annual meeting ofthe American Astronomical Society (AAS) in Washington, D.C., suggests that ifCoRoT-7b's orbit is not perfectly circular, gravitational tugs from one of itstwo sister planets could push and pull the surface, creating friction thatheats the interior of the planet. This heating could cause extensivevolcanism across the planet's surface, with even more explosive activitythan Jupiter's moon Io, which has over 400 volcanoes. 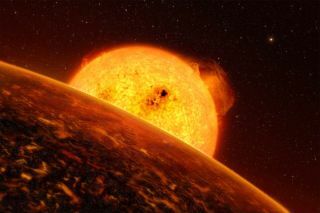 If this turns out to be the case, as scientists' modelssuggest, CoRoT-7b could be a new class of exoplanet, the Super-Ios, said one ofthe researchers who made the finding, Rory Barnes of the University ofWashington in Seattle. Other rocky planets orbiting close to their stars intidally-locked orbits could also display such rampant volcanism, Barnes said. Another study presented at the AAS meeting suggests that thecurrent form of the planet might not even been its original one: It could bethe core rocky remains of a Saturn-sized gas giant. The hot dayside temperatures of the planet not only meanthat it could have a vaporized rock atmosphere, but that that atmosphere couldbe boiling off of the planet altogether. The rate of solar heating on theplanet could have already cooked off several Earth masses of material from theplanet. Jackson, of NASA?s Goddard Space Flight Center, modeled theplanet's mass loss and changes in its orbit and effectively turned back theclock. Jackson and his team found that CoRoT-7b could have once weighed in at100 Earth masses ? about the mass of Saturn ? when it first formed. At thispoint it may have been 50 percent farther from its star than it is now. The research also showed that regardless of whether theplanet started life as a gas giant or a bigger rocky world, it has probablylost several Earth masses of material since it first formed. "You could say that, one way or the other, this planetis disappearing before our eyes," Jackson said. Jackson and his team think that other exoplanets close totheir sun could also be evaporating. So-called hot Jupiters ? gas giants whoseorbits hug their star ? could also be undergoing mass loss right now,eventually leaving behind rocky cores like CoRoT-7b. And Super-Ios and remnant cores are not mutually exclusive,Jackson and Barnes said ? CoRoT-7b, and other exoplanets ? could belong to bothclasses.